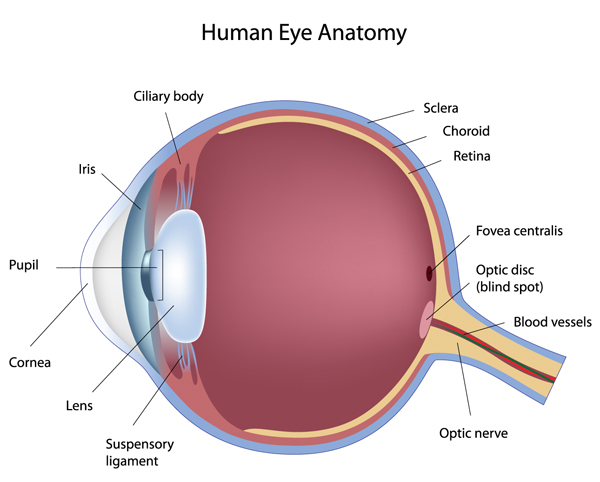 Retina is the light sensitive tissue in the back part of the eye. When light enters the eye, it passes through the cornea, the lens and then the image will fall on the retina where these light sensitive tissues (photoreceptors) process the light energy and convert it to an electric stimulus so our brain can perceive the image. If one compares the eye to a camera, the retina would correspond to the film or the negative that is placed in the camera when taking pictures. The macula and more specifically fovea (see diagram below) is the central part of the retina. The fovea is responsible for sharp and colour vision. This area is extremely small (0.5 millimeter) and comprises of dense population of photoreceprtors, all tightly packed in an organized manner. Any disruption to this delicate anatomic area will cause distortion of central vision, a devastating consequence of any disease. The more severe the condition, the more severe the distortion and studies suggest that the sooner the offending cause is treated, the better the chance of retaining vision. With advancing technology remarkable achievements have been made in the world of retinal disease over the last decade, however as with most conditions a prompt assessment is of paramount importance in improving the chances of retaining and improving vision. Many conditions affect the macula region but there are 3 conditions that account for the majority of vision loss as a direct result of damage to the macula. These are Age Related Macular Degeneration, Diabetic maculopathy and Retinal vein occlusion. I have made a brief and basic introduction to these conditions on this website. It is important for patients not to self diagnose and to seek prompt help from a healthcare professional if they have any visual symptoms.